Republicans lie about Planned Parenthood, incite violence. The party of personal responsibility should take responsibility for its words. 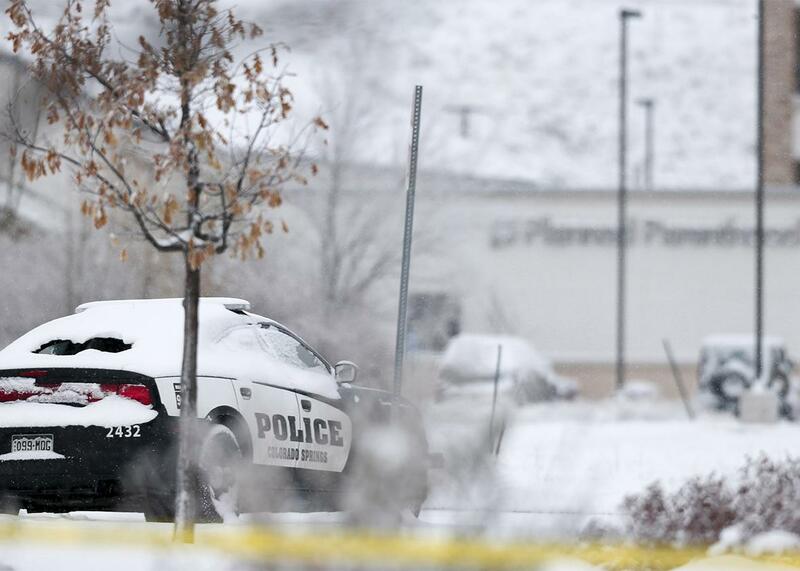 A police car sits in the snow with its back window shot out, outside the Planned Parenthood clinic the day after a shooting there, in Colorado Springs, Colorado, Nov. 28, 2015. In the days after Robert L. Dear went on a shooting spree in a Colorado Planned Parenthood, killing three people and injuring nine and telling law enforcement “no more baby parts,” many commentators have observed that the blame for this act of abortion terrorism can be placed directly on Carly Fiorina, Ted Cruz, Mike Huckabee, a GOP committee’s endless investigation into Planned Parenthood, and the maker of a wholly discredited “sting video” intended to show that Planned Parenthood cheerfully sells “baby parts” for profit. While we still do not know the shooter’s motive, what is clear is that Planned Parenthood has been the subject of vicious and unsubstantiated statements attacking an organization that provides critical health care for millions of Americans. I strongly support Planned Parenthood and its work and hope people realize that bitter rhetoric can have unintended consequences. Ted Cruz, who claimed again this week that Planned Parenthood is “selling baby parts” and only days ago celebrated the endorsement of the head of Operation Rescue, Troy Newman, a man who has stated that the government has a duty of “executing convicted murderers, including abortionists,” similarly lashed out on Sunday at the “vicious rhetoric on the left, blaming those who are pro-life.” The vicious rhetoric here, please note, is on the left. There are, of course, a million possible circuit breakers of causation. Given Dear’s apparent mental state and criminal history it will be difficult to find a clear, single cause, although when a man mumbles about “baby parts” upon arrest, it’s unlikely he was upset about the price of stamps. Dear’s instability, Donald Trump was quick to point out, absolves the Planned Parenthood fabulists from any charges of incitement. Jonah Goldberg similarly argues that crazy people are inspired by important First Amendment speech all the time, and we don’t ban The Catcher in the Rye or The Dark Knight just because they inspire someone to shoot John Lennon or open fire in a theater. Of course nobody wants to ban, or even punish, the speech of Fiorina or Cruz—we just ask that they think of potential consequences before they use their capacious media influence to spread incendiary falsehoods. Gun policy couldn’t possibly be to to blame, either, because it’s never to blame. And that means that the president will say “enough is enough” once again in a few days, when the next mass shooting occurs. Let’s say that—as is apparently the case in every massacre that takes place on U.S. soil—there is nobody and nothing to blame. And indeed that nobody causes bad things to happen, and—more importantly for argument’s sake—nothing in fact even contributes to bad things happening. They just happen, and then the liberal media politicizes it. But might one not then question whether the same rules of zero causation/zero responsibility should be applied to other issues? For instance, just as these GOP contenders would tell us that nobody caused or contributed to the clinic shootings other than an “evil guy,” can’t we also just accept that nobody caused or contributed to the events of Benghazi, beyond some “evil guys?” And certainly the cause of the Paris terror attacks (terrorism? ISIL? Religious fundamentalism?) is awfully hard to isolate. Too many circuit breakers. Can’t we just agree to agree that this too was the act of “evil guys?” Sept. 11? Evil guys. If we are really going to go through the ritual disclaiming of responsibility for any and every domestic act of terror, can’t we do the same for all of them? Or is it as simple as this: When foreigners do it, it’s evil; when Americans do it, it’s just too reductive to name a cause or even a contributing factor. The fact is, as Heather Digby Parton has pointed out, those who incite mentally ill people to violence do bear some responsibility for the fact that mentally ill people will respond violently. This isn’t a call for censorship, but it’s a reminder to the party of personal responsibility that taking responsibility for one’s words is part of being an adult. Nobody wants to send Fiorina or Huckabee to jail for their abortion clinic ideas. But when their intensely inflammatory and deliberately shocking language coincides with not one but six actual attacks on Planned Parenthood clinics—and a massive upsurge in threats of violence—it’s sort of absurd to suggest that there is no conceivable connection. Oh, and there is this as well. What they are saying is a lie. Every single state to have investigated the Planned Parenthood baby-parts accusations has found nothing. The congressional search has also turned up nothing. The videos cited repeatedly by Fiorina and co. do not prove what they set out to prove. There is no factual or empirical basis from which to believe that Planned Parenthood sells fetal parts for money. Indeed, more and more the candidates, like Trump, hide behind the passive “lots of people are upset about this” language of the not-quite-persuaded. And so when the same leaders who claim that there is no factual connection between themselves and the clinic killings are unwilling to recognize that there is vastly less factual connection between Planned Parenthood and profiting from baby parts, the problem is no longer a speech problem at all. It’s a reality problem. One side is lying about Planned Parenthood and declining to admit the truth about the consequences of violent, graphic rhetoric. The other side is pointing out that the lies about Planned Parenthood are lies and that words have consequences. There is no equivalency here. There is only the new truth of American political lies: that you can lie, and lie about the lie, and then blame the media.